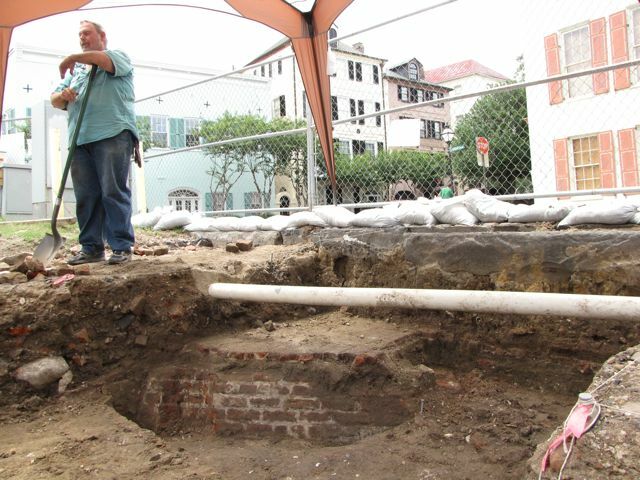 As Katherine Saunders reported on Friday, the archaeologists digging at the east end of Tradd Street have located what appears to be the apex or point of the old redan that once stood at this site. 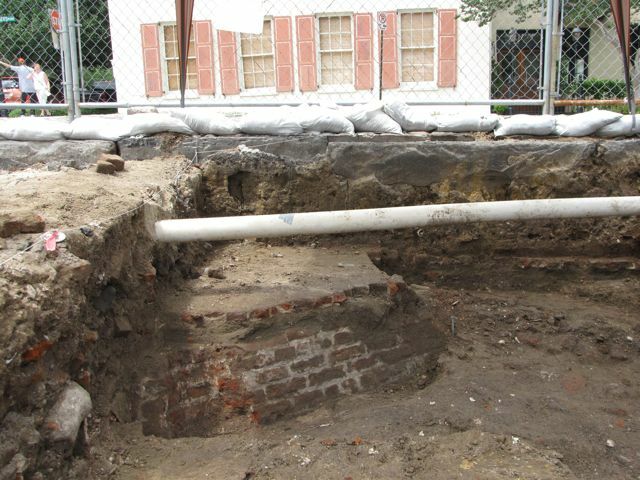 Today the College of Charleston archaeology students continued their careful excavation of the area around the old brickwork, making it a bit easier to view and understand what they’ve found. Let me guide your through the images above. Clockwise from the top left is Ron Anthony, archaeologist with the Charleston Museum and the College of Charleston, resting on his shovel just behind the apex of the redan. In the center of the top row is a side view of the apex, looking north. Note that the tip of the redan appears to project a bit beyond the “no parking” sign in the background (a useful landmark for future interpretation). 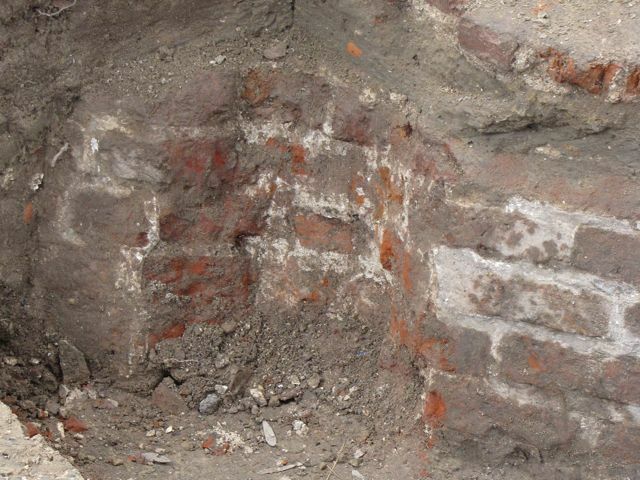 The top right photograph is a close up of the remnants of the tip of the redan, and illustrates the fact that some of the superficial bricks were disturbed many years ago. The bottom left image shows the southern face of the redan near the apex. Note that the brick pavers representing the floor of the Lower Market, ca. 1786, are still present on the top of the redan. The bottom center photograph offers a close-up view of a curious feature on that south face. 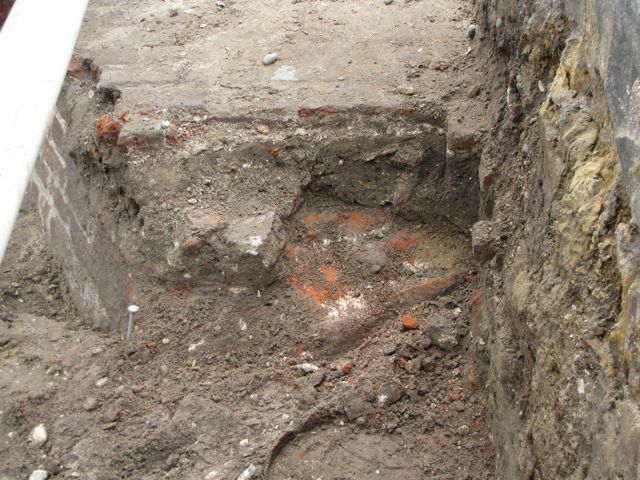 It appears that part of the redan brickwork was carved out in a half-cylinder shape. We saw a nearly identical feature last year when digging the north wall of this redan. In both cases, I suspect this feature represents a post hole made ca. 1786 when the Lower Market was extended over the site of the old redan. 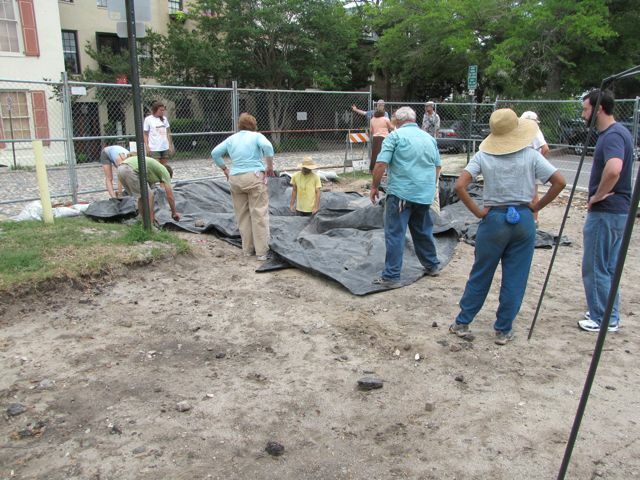 The final photograph for today shows the crew spreading the tarps over the excavation site. We’ve had a lot of rain in the past few days, and we don’t want the site to be damaged by another late-afternoon downpour. While the crew and the members of the Mayor’s Walled City Task Force are thrilled to have located the redan, we’re a little puzzled as well. The location of the apex is not as far east as we had anticipated, thus making the overall size of the redan a little smaller than we thought. No one is disappointed, however, but this new information is causing the archaeologists to rethink the plans for the rest of the dig. 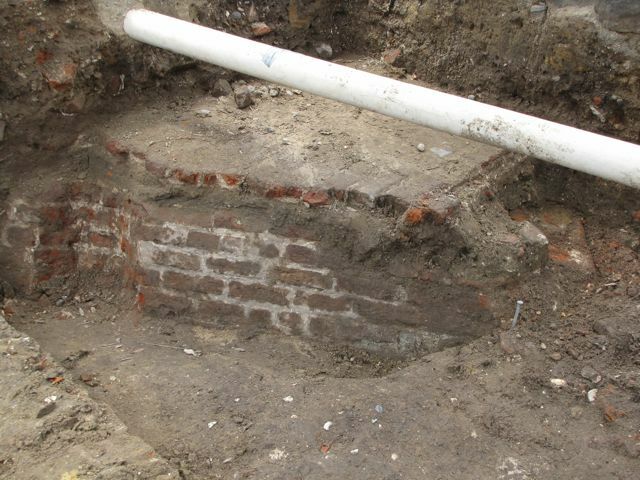 Suddenly we’re chasing the wall in a slightly different direction, which means that the modern utility conduits and nineteenth-century building foundations will curtail some of the anticipated digging. Regardless of these issues, the work will continue for a few more weeks, and we look forward to some very interesting discoveries.